Opens the 31st Season of O.S.J. SAN JOSÉ, CA –Opera San José opened its 31st Season with RIGOLETTO. on September 6 at the California Theatre. Opening night was one of those performances in which the music was played with feeling, the arias were sang in good voices and the technical details of the opera were in place. The work, considered by many “Verdi’s masterpiece,” was masterfully presented. It ended with a standing ovation. Unknown to many, RIGOLETTO, is an ópera that “almost” was banned from the stage for life. The reason was that while its music was composed by GUISEPPE VERDI (1813-1901) without any problems, its libretto written by FRANCESCO MARIA PIAVE, was involved in years of controversy. In l850, VERDI had a contract from the Teatro La Fenice in Venice to produce a new opera. He had agreed with RICORDI, his publisher, that the ópera was going to be Stifellio, but just a few days later, VERDI wrote to PIAVE, his librettist, that he had found what he described as “The greatest drama of the modern times.” The work was Le Roi’s Amuse a play written by VICTOR HUGO (1802-1885) in l832, which depicted the escapades of François I, better known as “the initiator of the French Renaissance in France” and “Father and Restored of the Lettres”, because he attracted many Italian artists to work in the Chatêau de Chambord and standardized the French language. The son of Charles, Count of Angoulemê and Louise of Savoy, was a monarch of the House of Valois, who had succeeded his cousin, and ruled as King of France from 1515 until his death in l547. Victor HUGO had first presented his play in the Theater Française, in Paris in November l832, but its recepcion was so stormy that the French authorities banned the play from showing in France for fifty years after its first performance. So, after many verbal and written fights with the Italian authorities, to be able to use it as his ópera’s libretto, Verdi got the approval he wanted, but was forced by the Italian Censors, to change it: The action in the play was “transported” from France to Italy. The King, became The Duke of Mantua. Blanche, became Gilda; Sallabudil, Sparafucile; Castiglione, Monterone, and Triboulet, Rigoletto. The name of the Opera which VERDI had called La Maledizione (The Curse).was changed to RIGOLETTO. The other reason why RIGOLETTO the ópera is so loved, is its music. The perfect way in which VERDI adapted his melodies to the action: Gilda’s aria “Caro Nomen,” for instance, is one of the most lyrical expressions of a woman’s feelings for the man he loves. In complete contrast, the Duke’s “La Donna e Mobile” is a very light aria, as light as the promises of “eternal love” that the handsome Duke gives to every woman he seduces. The excellence in the opening night performances of Opera San Jose’s RIGOLETTOS began with the orchestra. Under the baton of Conductor JOSEPH MARCHESO (O.S.J. new music director) the pathos of RIGOLETTO’s drama was felt from the very first notes of its overture, which was played in a slow tempo to allow their sound to express the impending catastrophe, in a musical dialogue of the brass instruments and the strings, interjected by drums’ beats. Later on, in his direction of the music during the opera, the arias were felt, because Maestro MARCHESO allowed the singers to express the lyrics by either slowing the music or fastening the tempo just a little bit. We can also add that on that night, the orchestra never overpowered the singers, but accompanied them unobtrusively. And there were plenty beautiful voices singing on that night. One of them the voice of Resident OSJ Soprano ISABELL IVY in the role of Gilda, (pictured below) that was exquisite. Her tone mellow and rich in color. She showed complete control of her instrument, on that night. Her voice sounded rich in tones, when needed emotion and lyrical in her melismatic passages. Her tone was fluid. In her acting, IVY’s Gilda displayed a lot of feeling in each one of the emotions she was portraying on the stage. Her Caro Nomen (Loved Name) the aria in which she expresses love even for the name of the Duke, her beloved, got her an ovation. She also did a wonderful performance singing her Ciel Dammi Coraggio, in which among sobs, she reveals to her father her abduction and dishonor. IVY’s Gilda was in character from beginning to end. Another good tone of voice belong OSJ resident tenor KIRK DOUGHERTY who played the Duke of Matua. (see picture left) While his singing was perfect, his characterization of the libertine/seducer, Duke was too constricted. On that night, his role would have needed much more charm. OSJ resident LISA CHAVEZ, was convincing in her role as Magdalena which she represented convincingly. SILAS ELASH as his brother, gave us a realistic Sparafucille. The sonorous baritone voice gave us an imposing Count Monterone (EVAN BRUMMEL) on that night, and tenor DANIEL CILLI played a convincing Marullo. In a unique touch of genius stage Director BARD DALTON, started the production with Rigoletto (MATTHEW HANSCOM) singing, standing in front of the close curtain, which impacted the work from the beginning. It lost the impact, however, when the curtain opened and transported the audience to the inside of the Duke’s palace (beautifully designed by STEVEN KEMP) where a party is taken place. 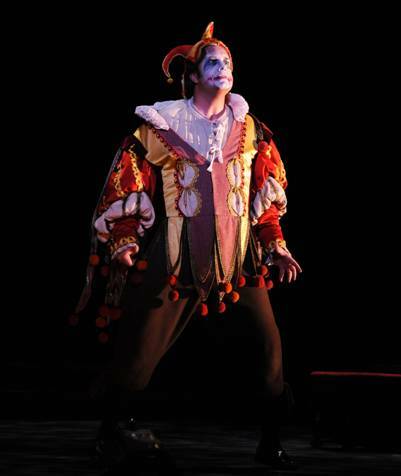 There, close to his patron the Duke, Rigoletto (HANSCOM) as Jester “jokes” playing with the guests using his jester’s decorated stick in between his legs to simulate his manhood. Hhis action, looking more vulgar than funny. In the next scene, however HANSCOM, returned to character when removing his makeup and looking at himself in the mirror sings his aria: Io la lingua egli ha et pugnale in which he compares his tongue to a sword, pities himself for being ugly and reveals his great love for his daughter. The feeling, in his interpretation, made this and his final aria, holding dying Gilda in his arms, his most powerful arias on that night. In his acting, HANSCOM impersonation of Rigoletto was superb. The male choruses (ANDREW WHITFIELD) sounded rich and well-tuned. 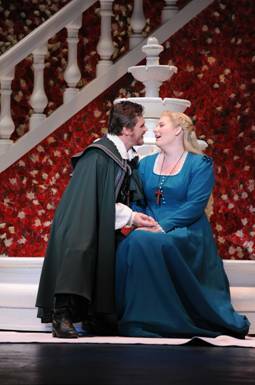 On that night, the combination of the stage direction (DALTON) the superb singers and actors and the orchestra conducted by Conductor MARCHESO, made RIGOLETTO one of the best productions of Opera San Jose. RIGOLETTO will play until September 21th. at the California Theatre, 345 South First Street, in S.J. They may be ordered by calling 408-437-4450. (Seniors 65 and older) get 10% discount. Students 25 and younger (with current ID) pay $11.00 for ticket (cash only).